A new theory about the origin of the enigmatic and contested Lewis Chessmen. My copy of the book visited the Lewis Chessmen during the review! With the ICC charges against militants accused of destroying heritage at Timbuktu, the idea of heritage destruction as a war crime. The islamic documents and artefacts were stolen and smuggled after the 2011 Revolution. No word of Sotheby’s response. Journalist Nashaat El-Alwany was attached by unknown assailants, however his family claims 5 individuals from an antiquities smuggling group are bending the shooting. Several 150-year-old cast-ironfences were stolen from the The Macrorie House Museum in Pietermaritzburg. The US and Nicaragua are extending their bilateral cultural property MOU for another 5 years. Another case of rampant design theft by the fast fashion industry. Actor Dylan O’Brien admitted that he and other cast members “looted Pueblo artifacts” while filming the movie in New Mexico last year. The petition has thousands of signatures: people care about cultural object protection. A lower court ruled that the Borough of Jim Thorpe, PA, is a museum under NAGPRA and thus the Sac and Fox Nation could request the return of the athlete’s remains. A federal appeals court said no. The stolen painting is property of the US Government and was found for sale at an auction house with a covered WPA label on it. Of course I wonder about the legal status of the antiquities but one crime at a time. Andover Newton Theological School says that it was advised incorrectly about the collection of Native American items in the past: “It was always our intention to adhere to the law”. The street artist is facing felony charges for destruction of property. Ron Lauder, president of the World Jewish Congress, has expressed disappointment in the Gurlitt case task force. Has Switzerland done enough to ensure that the Bührle is free of Nazi Loot? The new sentencing guidelines will take into account the emotional harm caused by loss of heritage. “It would be like raising money to buy stolen goods.” It seems DCMS wanted the Save Sekhemka Action Group to fundraise to BUY Sekhemka. DCMS denies this. “More than £2,500 was stolen along with gold ornaments and other items” from the Sikh temple in Crawley. The police don’t think the murder of Sebastiano Magnanini has anything to do with his past as an art thief. There is a resurgence of lead theft from UK churches. More on the increase in lead theft from churches. The 14th century tombstone of Robert de Markham disappeared from Rufford Abby in the 1950s and has now turned up again! The artist Stephen Bambury claims that his former agent sold works without telling him and kept the money. Might the economic slowdown make a bad looting situation in China even worse? An article about the actions of museum workers to hide collections during the 1920s to the 1940s. The too-good to be true sale was: the man was conned into buying what would be illegal ancient gold coins. They were fakes. 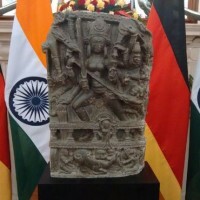 “Stolen from a temple at Pulwama in Kashmir in the 1990s”, sold by Subhash Kapoor. A silver statue of Lord Adinath was stolen from the Jain temple in the Padwa Sagvadha area of Dungarpur, one of several thefts from area temples in the past few days. Due to thefts and other security issue, guard strength is being increased at cultural sites. A profile of provenance and artefact repatriation researcher Vijay Kumar. The idols were stolen from Parshavnath Digambar Jain temple, Aurangabad. The temple has been robbed of idols twice before this year. The people had been illegally excavating two burial sites in Gyeongsan, North Gyeongsang for over two months. This article is a collection of satellite images of destruction. It has been found that locals are dumping rubbish in the famous Amintas tombs. This is the same piece that was reported on before but it is worth saying that “just give the loot back” is a lovely option.